When I was growing up I thought my adult life would go as follows: I would meet someone at college and we would live wherever our careers took us (mostly his because I still don't know what I want to do when I grow up:) This is how my life actually went: I met my future husband while I was home for summer break and we've been here ever since. As a matter of fact my whole family has been too. I was a little put off that I was living in the same place where not only I grew up, but where my dad grew up as well. I didn't really feel like an adult. Then I had kids. And my kids got cousins. And I realized that having so much family around was indeed a fabulous thing, and not only because I have never paid for a babysitter (yes I am seriously so blessed:). Tomorrow my little brother Brandon and his wife Cara are moving to Idaho to start their grown up lives. Regardless of what I said in the previous paragraph, I think is great that they are having adventure and going out on their own, I am just going to miss them so much. I will admit that I think about moving away all the time, especially during the summer. I would only have to convince a few of my family members to move with us. I know Brandon and Cara will come and visit, but it's not the same as seeing them every week (or every other week) at Sunday dinner. Even if we didn't always get to visit one on one, they were there. I'm excited for them to go after new opportunities and I hope they do great. At the same time I am very sad and, for my own selfishness, I wish they would stay. Update your blog often so we can sort of pretend you're still here. We love you, good luck and we'll miss you guys a ton! 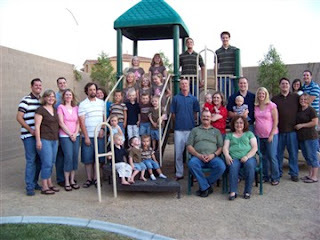 The Lowell and Susan Hafen family, August 2008. There are 33 of us with three more coming by the end of the year. Today we sent three kids to school! Actually Chris did the sending, I could barely sit up because I was feeling dizzy and nauseas (no I'm not pregnant! I am feeling much better now thank you). Dalin started the day by waking up at 6:20 am, and I guess he was too excited for school to start because he made sure everyone else was awake by 7:00. Because I was sick Chris stayed home from work to help, thank goodness. He got everyone fed and made sure they were dressed and he even had the girls make their own lunches. I did drag my self out of my sick bed so I could do Kaylee and Ashton's hair. That really isn't Chris's forte and I just couldn't handle the thought of them having a bad hair day on the first day of school. 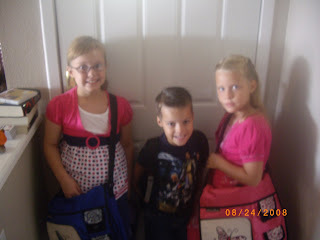 Kaylee is in fourth grade Ashton is in second and Aiden finally gets to start kindergarten. I think it was a good experience for Chris to see what I get to do almost every day. After Chris came home he took me to the urgent care to find out what was wrong with me. Of course I was feeling much better (that always happens when we go to the doctor) but there was about twenty people in front of me. We didn't have the time to wait because there was only an hour and a half before it was time to pick up Aiden, so my mystery illness is still a mystery. 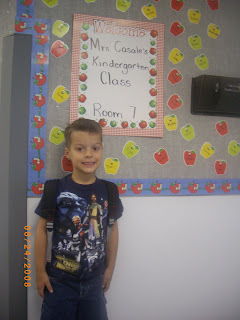 It was a good first day to start out the school year, for the kids any way. 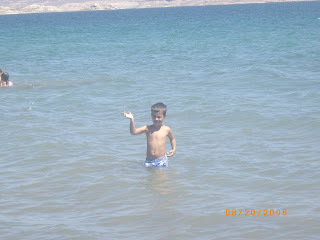 This past Thursday my sister-in-law Katrina and my sister Carmen went to Lake Mead with our kids. I didn't realize until after Katrina asked me to go, that I haven't been there since before Chris and I got married (that's 11 years!). More than a little sad considering we live only about 20 min away. I had five kids with me (my four and my nephew) and I was a little worried that my time would be spent trying to keep them all from drowning. The water ended up not being that deep and the girls were able to go out about 20 or 30 feet and the water still only came up to their shoulders. They had a great time playing with Katrina's niece Jade who has been visiting. 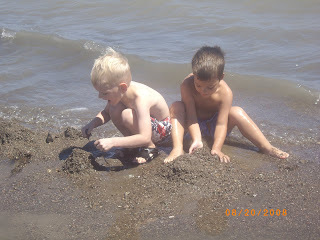 The boys went out for a little bit, but Aiden got tired so he spent his time building a sand castle with help from his brother and cousins. My nephew Jayden is a pretty good swimmer and fearless when it comes to the water, but he is kind of small and I was afraid the waves were going to carry him away so I kept calling him back. He finally gave up and decided to help Aiden too. It was much more relaxing than I thought it was going to be so I'm excited to go back. 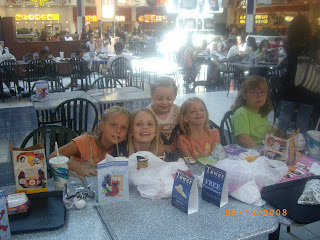 Jade, Ashton and Kaylee in the back. 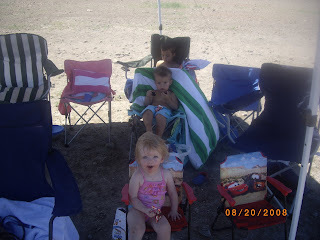 Jayden and Lance in the front. The beginnings of the "biggest castle ever!" The construction crew and their finished project. Last night Chris and I went to see the Cirque de Solei show at the Wynn hotel called Le Reve for free (ask Chris how he gets these tickets). It was performed on a stage in the water. The stage itself was kind of amazing because at some points it was tall enough for the performers to stand on, but at other times it was down deep enough that some of the performer could be dropped from the ceiling and not hit it. The show itself was a little to abstract for my taste. I guess I should have read what the story was supposed to be before I went. I think it was supposed to be a dream, which included a battle between good and evil but I could be wrong. I will say that I was amazed at how long the performers could hold their breath, but other than that I can't say it was my favorite show ever. It was free though and I got to have a date with my husband so I really can't complain. *I just looked up the info about the show and "le reve" is french for the dream. Point for me! I also read that there are scuba divers under the water feeding the performers air as they need it. Duh, I should have thought of that. No we weren't shopping for new cousins, (don't worry, I knew that was a lame joke before I even typed it. I couldn't help myself:) we did have our second annual girls only back to school shopping trip. The cousins always have a fun time when they are together no matter what they are doing, but they enjoy it even more when they get matching outfits out of the deal. There was an overload of all things Hannah Montana, High School Musical and Camp Rock. My kids didn't get any of the paraphernalia but I am amazed at all of the stuff they put these teeny-bopper heart throbs on. Not to be outdone the boys got together to have their own fun at the movie theater. Chris took Aiden and Dalin to see Star Wars Clone Wars and they were joined by a few of their uncles and cousins as well. It was the "best movie ever!" 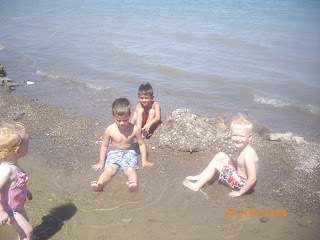 according to Aiden, and I heard that Dalin even sat still to watch it, until he fell asleep. I finally bring my camera with me, and I only took one picture. I guess I'm not a blog professional yet. I've had this flier stuck on my bulletin board for maybe a year or two, and today we finally took the Chevys tour. 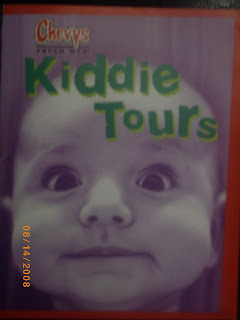 The brochure outlines a tour of the kitchen followed by the kids making their own taco. When we got there we were seated at some tables and they gave the kids some dough to play with, then we were given chips and salsa and drinks. After a while we went into the kitchen. There were 15 kids and six adults so we split up into two tour groups (boys & girls). It was interesting enough, but big hit with the group I went with was the ice. The guide said she had never gotten a "wow" for the ice machine before, but the girls loved it. After the tour they brought each of the kids their own plate of quesadillas, fries and an orange and a couple of plates of chicken quesadillas for the adults. I know this doesn't sound so fabu, but the kids liked it, it was inside out of the heat and it was FREE! My kids were a little disappointed that they didn't get to make tacos, but they got a whole lunch for free so I wouldn't let them complain. *My sister-in-law who also went on the tour was faster to post about it and smart enough to bring a camera, so if you'd like to see pictures you can check out her site here. On Monday Ashton had a talent show at her school. One of the first grade teachers had her class do Micheal Jackson's Thriller dance. That one was pretty funny. Ashton's teacher had her class do a dance to "We're all in this Together" from High School Musical. Ashton also sang a solo, "Stick to the Status Quo" also from High School Musical. I was very impressed because I know I never would have had enough courage to do that when I was her age, I still don't. 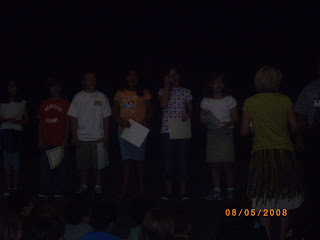 Wednesday we went to Kaylee's school for her honor roll assembly. They give out dog tags to the kids who make the honor roll, and today they handed out a special green tag to those students who made the honor roll all three times during the year. 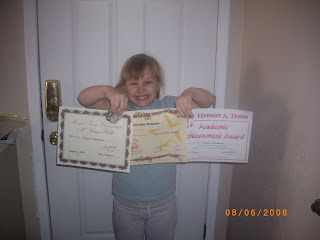 Kaylee got a certificates for making the "A" honor roll for this term and through the whole year. She also got another award that we didn't expect, student of the year for her class!! (Hooray! Woo Woo! Yea!) We are so proud of her! The pictures I took at the actual assembly turned out really dark, so we had to settle for an after the fact picture at home. This is a phrase my dad likes to use, and sometimes things just sound better in Spanish. Dalin is now officially off the pacifier! Woo Hoo! The day after the pasu post we accidentally left our last known pacifier at my brothers house. 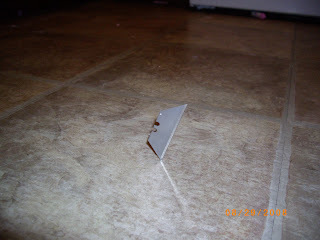 Dalin was tired enough, that when he asked for it at bed time and I told him I would go look for it, he believed me. He was asleep within five minutes. He does ask for it at least once a day, but his requests are not accompanied by a full blown tantrum like they have been in the past. So my goal to ween him before Chris came home was accomplished! I have to be careful about letting him see the blog though, because if he sees the picture of him with it he misses it and gets a little whiny. Another small miracle in the Edwards household is our kids are doing the dishes on a consistent basis! Woo Hoo x2! Years ago, after what I'm sure was a frustrating day for my mom, my dad asked what he could do to help. She said if he would do the dishes it would help a lot. That is the day the kids started doing the dishes. Now that I am a mom, I completely appreciate how this little service can make me so much happier (or nicer). They earn kid cash, the amount depends on how many times we have to ask them and how quickly they get done. Dalin loves to help too! So I am getting the help I need and the kids are learning some life skills. Win, win. On a side note I've really enjoyed our kid cash system, it has really worked well for us. The kids know they can get more if they do their chores, and it can be taken away if they are misbehaving. The current exchange rate for is 10=$1, it seems to work better than toys from the treasure box because they never really play with their toys more than twice, three times tops. They think it's cool that they can have their own money, but they are kind of cheapskates when it comes to spending it. If their parents are buying it's a different story entirely. It makes them think twice about what they really want. Woo Hoo x3! 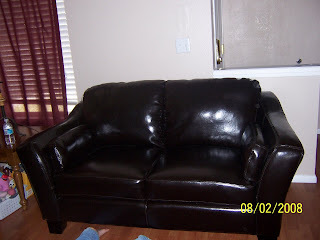 Last year we had our couch and love seat cleaned as part of a labor exchange. Chris did some computer work and we got our furniture cleaned. About three weeks later I noticed that the fabric was deteriorating. We couldn't sew the holes because the threads of the fabric were falling apart. Needless to say I was a little irritated. My irritation reached it's peak this week and I just couldn't handle looking at these couches that were coming apart at the seams any more. 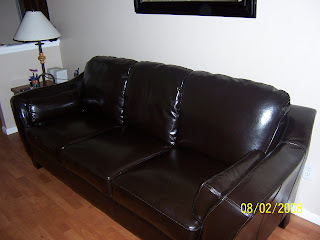 I have been looking at leather couches for a few months and on Wednesday I got an ad that had really the best deal I had found on a leather sofa. So I decided to surprise Chris and I bought a new couch and love seat. I was told they would be in the next day, but I told them I would come pick them up on Friday. After arranging to have my brother Jason meet me with his truck I got to the store and they told me only the sofa was there. Re-enter irritation. I told them that was unacceptable and that they would have to deliver the love seat for free (I should have asked for more, but I couldn't think of what else to ask for). They said okay, but they couldn't deliver it until Tuesday. I said fine, but that I was very unhappy about the situation. After thinking about it for a few hours I decided half a surprise wouldn't really be as fun as the whole surprise so I called the store and told them I would pick up the love seat myself, but that I needed some compensation for their folly (okay I didn't really say folly). I ended up getting $50 off the love seat, and I am lucky enough that my other brother Jordon was able to help me with his truck. I have really fantastic brothers! I stressed to the kids that it was important to the surprise that they didn't tell Chris about the new furniture. They were willing to cooperate, but Kaylee asked "what if Dalin tells daddy?" I told her it wouldn't matter because daddy wouldn't be able to understand Dalin's toddler speak. As soon as Chris picked Dalin up to give him a hug Dalin said, "got new couches." I was right, Chris couldn't understand what he had said, but I was laughing too much so Chris knew something was going on. When Dalin repeated himself six more times, and Chris did figure out what he was saying. It was too funny, that little squealer! After we got every thing set up Aiden said "These are the kind of couches in fancy houses." I'm enjoying our little bit of fancy.